While this article addresses Angels in general, and what is referred to as “Guardian Angels” specifically; the primary subject is the preeminence of Jesus Christ, as it should be. While both Catholics and Protestants would consider the above statement as a correct doctrinal pronouncement, at least as of the last 600 years; is this firmly established in God’s word? Some suggest that as ministering spirits which do God’s Will, one of their functions would be that of Guarding human beings. However, the grammar does not allow for this interpretation as the object is God, and the subject is His greatness, and Angels are mentioned as His servants to worship and follow His Will as the Divine Creator of all creation, and eternity. To suggest that the Scripture implies or allows for the doctrine that certain angels have a primary function or assignment of protecting human beings is “reading into the text” (This is a common mistake committed by many Christians, it becomes easy when we handle God’s Word without fearful respect, wherein we attempt to prove our own presuppositions [or “things that just make sense”], and perhaps unknowingly utilize God’s Word as a prop. This is done most of the time in ignorance or naivety; as opposed to guile or wrong motives as practiced by the heretics. We are all subject to this type of misinterpretation, and must guard the reading and study of God’s Word with reverence; utilizing the grammar to understand what the text is meant to convey. Many who teach, find it far too easy to comfortably present God’s Word according to our English translations, rather than turning to the original languages which God chose to convey His Word, those languages wherein they were God breathed, the inspired Word of God. Translations always fall short due to the inability to translate certain words that exist in the original work, which do not exist or are diverse in the translated final work. To grasp the full meaning of God’s Word, we need to discipline ourselves to search out the original text and understand the grammar; wherein many controversies fall away so very easily. ), information that is not provided; and in fact would rub against the grain of what is stated. What the Bible does provide concerning information regarding Angels is that on a few occasions they protected groups of individuals; on singular occasions, rather than throughout their lives (the Israelites, and the church), and a few examples of them protecting individuals themselves; yet again on certain occasions, during certain events; however not throughout their lives. In fact, there is no Biblical evidence whatsoever which promotes the concept that ALL humans, or even individual believers that have assigned Angels that are specifically regimented for their protection. 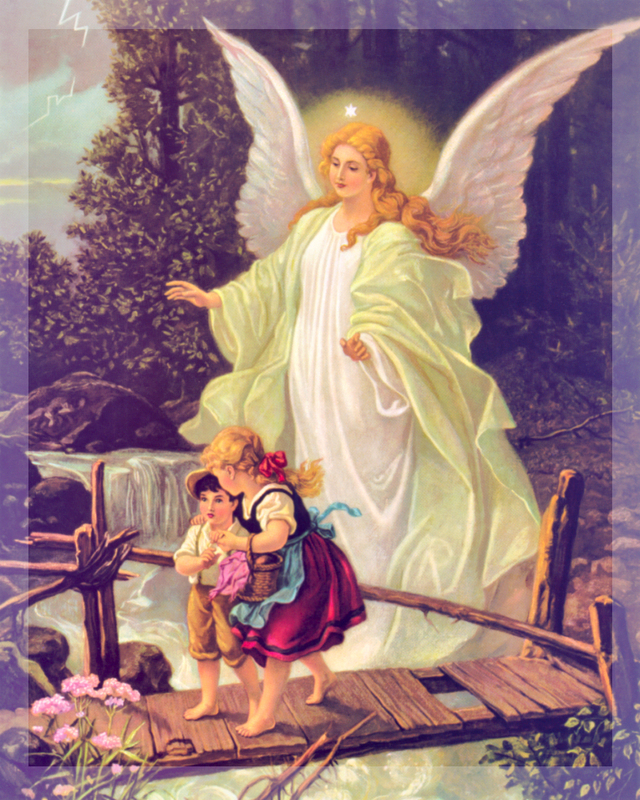 The confusion has been that of mistaking individual situations wherein God has directed an Angel to protect an individual or group at a certain time during a certain event; with the assumption that these Angels have the permanent assignment to protect these individuals their whole life. Such as the situation concerning Lot in Sodom and Gomorrah, wherein in actuality the primary assignment of the angels was the destruction of the cities, yet they were not allowed to harm Lot, and therefore protected him during their assignment. What we should grasp from this situation is that God would not allow the righteous to be judged with the unrighteous (“And turning the cities of Sodom and Gomorrha into ashes condemned them with an overthrow, making them an ensample unto those that after should live ungodly; And delivered just Lot, vexed with the filthy conversation of the wicked: (For that righteous man dwelling among them, in seeing and hearing, vexed his righteous soul from day to day with their unlawful deeds;) The Lord knoweth how to deliver the godly out of temptations, and to reserve the unjust unto the day of judgment to be punished” ~ 2 Peter 2:6-9), and that it is God Who protect us, as His children through whatever means He chooses to use, rather it is warning that danger is approaching (Hebrews 11:7; Genesis 41:30-31; Exodus 12:23; Jonah 3:4-5), or the use of His Angels to do the work specifically. The doctrine of the Guardian Angels is a very ancient doctrine held by many false religions; as well as the Jews; especially after the Babylonian captivity. The Jews had taken the belief concerning Guardian Angels to an extreme where the power and control of God was usurped by the spirit beings that aided men. It is believed that the Jews (Hebrews) received this teaching from Zoroastrianism, which referred to Guardian Angels as the Fravashi. ággelos; gen. aggélou, masc. noun. “Messenger,” one sent to announce or proclaim. (I) A messenger, one who is sent in order to announce, teach, perform, or explore anything (Matt. 11:10; Luke 7:24; Luke 9:52; Gal. 4:14; James 2:25; Sept.: Josh. 6:17; Mal. 2:7). In 1 Cor. 11:10, aggélous, acc. pl., is interpreted variably as spies or angels, good or evil, even demons. The angels of the seven churches are probably the bishops or pastors of those churches, the delegates or messengers of the churches of God (Rev. 1:20; Rev. 2:1, Rev. 2:8, Rev. 2:12, Rev. 2:18; Rev. 3:1, Rev. 3:7, Rev. 3:14). Hebrews 13:2 may have reference to itinerate preachers rather than angels. The term “Angel” has been used as a synonym for “ministering spirits,” as seen in Hebrews 1:13-14 where the two terms are used for single type of being (“But to which of the angels said he at any time, Sit on my right hand, until I make thine enemies thy footstool? Are they not all ministering spirits, sent forth to minister for them who shall be heirs of salvation” ~ Hebrews 1:13-14 – the 2 nouns, Angel and ministering spirits are used as referring to the same entity). And whereas the entities referred to are created beings, the common denominator is that their function is singular in that their service is due to God and God alone. The exception to this is those Angels who followed Lucifer, hence referred to as fallen Angels. God’s Angels have always been known as His servants following His directions and never loaned out, or associated with any other function than to singularly follow God’s commands. As has been stated there are individual assignments, temporary in nature wherein God has elected to send an Angel to do His bidding. Such as the Angel that killed 180,000 Assyrians (2 Kings 19:35); as well as certain individuals wherein Angels saved their lives, such as Hagar (Genesis 16:7, 9, 11, 17); and Lot (Genesis 19:1-24), and others; however, of the dozens of references to Angels, their main function was that of being messengers sent to individuals, such as: Abraham; Jacob; the Israelites going through the wilderness (“The angel of the LORD encampeth round about them that fear him, and delivereth them.” ~ Psalms 34:7); Joshua; the Angel prepared to kill Balaam; Gideon, Manoah, and the other judges; Elijah; Samuel and David; Daniel; Zachariah; Peter freed from prison; and Jesus and the Seven Churches of Revelation 3 and 4 (Rev. 1:20 – thought to be the pastors of the 7 Churches). The two most prominent Angels addressed in the Bible are the archangels Gabriel and Michael. The term Archangel is the reference that these Angels that function directly for God in the manner that we would refer to as Generals, or lead supervisors (Lucifer at one time was an Archangel). These 2 archangels are the only Angels that appear to have special assignments. Michael, whose name means “Who Is Like God;” was assigned to oversee Israel (Daniel 10:13; 12:1; Rev. 12:7-9). And Gabriel, whose name means “Man of God;” was assigned to the Messiah, those things concerning Jesus (Daniel 8:16; 9:21; Luke 1:19, 26). You will see there is a very slight difference in these 2 quotations. Lucifer, quoted the common day vernacular translation of the Old Testament in tempting Christ, referred to as the Greek Septuagint. Today, our current translations of the Old Testament comes from the Masoretic text, which was translated in the 9th century AD, from Hebrew, and therefore sounds different from when individuals in the New Testament quoted the Old Testament. Jesus, almost exclusively quoted from the Septuagint (except such as in Luke 4:18-19 ~ which is where Christ was reading the Hebrew Torah within the synagogue at Nazareth, wherein the custom was to paraphrase the Hebrew into the Aramaic common vernacular of the day); therefore validating the Septuagint version of the Torah. What is interesting is that when Lucifer tempted Eve he misquoted what God had stated, yet he was wise enough when quoting Scripture to Jesus that he did not misquote it (he knew Jesus would spot the misquote), but misapplied it; indicating that it was in reference to something that it was not meant, that of putting God to the test. This Scripture states that God had given his Angels responsibility to protect Christ on earth – it is an abuse of Scripture to imply that this passage refers to others as well. The point is, Psalms 91:10-13 is a reference to the Messiah, and to attempt to utilize it is as a reference to anyone else is again “reading into the text” what is not stated openly, nor implied indirectly. When this verse is taken in isolation, out of context; it appears to states that there are particular Angels that watch over individual children. However, if we examine the context according to the whole text itself, we find something different at play. The subject of this sentence is humility, and we notice again the use of the word “as“; indicating that were is not a direct reference to children, but that they are being used as an example, an analogy towards making the point of what humility looks like. What also validates this point is that from this point on, verse 6, a different Greek word is used. In Verses 3, 4, and 5; the Greek word translated into “child” is: paidion, yet it is not used afterwards. From verse 6 on the Greek word mikros, is used; which is rendered “little ones” (“But whoso shall offend one of these little ones which believe in me, it were better for him that a millstone were hanged about his neck, and that he were drowned in the depth of the sea.” ~ Matt. 18:6). The reason for the change is that in verses 3 through 5 the word “child” (paidion) is used allegorically to indicate any sense of humility and acceptance as displayed by child. This term concerns a person young in years. Yet, when the text becomes more specific, Jesus NO longer uses the term referring to a child; it utilizes the term which means “little one” (mikros) – which refers to one who is immature, as in this case a “young believer” – A believer who is new to the Faith. Therefore, this text is not speaking about child having Guardian Angels, as it is not talking about humility, and offending believers who are young in the Faith. What must be noted is the phrase “that in heaven their angels do always behold the face of my father which is in heaven.” The 1st question is where are the Angels? or better stated where are they not – they are not with the children or humble believers watching over them. They are in heaven observing the face of the Father concerning how the Father feels when one of these young ones is abused. The consideration and point of attention of these Angels is with God, not with the little ones. what this phrase is saying is that Angels, God’s messenger to men; representatives and ministers of God Almighty, habitually preside in God’s presence observing God’s Will to do what God would have them to do. A keyword in this phrase is the word “their,” which is a 3rd person pronoun, which is possessive; it is in the masculine, and is plural, and the case is genitive. Therefore, this word is correctly coupled with the little ones that it references; yet, what is not seen is that the little ones Angels are in the possessive of an individual. The possession here concerns mankind as a group, not individuals in particular. In essence what this Passage is saying (Matthew 18:10) is that these Angels, which do the bidding of God, stand at attention in God’s presence to do His will concerning mankind; therefore be warned concerning harming one of these immature believers. There is nothing in the Greek grammar to indicate that these Angels are assigned to individual humans that they are meant to guard specific people. The only place in Scripture that refers to anything like this as discussed above is Psalm 91 in reference to the Messiah. This is a reference to where Gabriel meets with John the Baptist’s father, Zacharias. Gabriel states in identifying himself “I am Gabriel, that stand in the presence of God.” This expression is used throughout the Bible to indicate that the Angels are God’s servants, who wait upon God at His beck and call. The idea is that the Angels are focused on God – it is about God that they function, not man. The problem with this teaching, besides not being supported by God’s Word; is that it ingratiate humanity to the servants of God rather than keeping our focus and gratitude upon God Himself. It is God that takes care of mankind, it is God that takes care of us as individual believers. God will not share His glory with anyone (“I am the LORD: that is my name: and my glory will I not give to another, neither my praise to graven images.” ~ Isa 42:8). And the problem that is created by this teaching this is that individuals start to pay attention to Angels, rather than God. If you do a simple Google search you will see how many ministries teach whole doctrines concerning Guardian Angels. They even go so far as to teach that believers should pray to their Guardian Angels, to seek their guidance, and to thank them for their aid. It has been wisely stated that a prophet is one who speaks for God to the people; and a priest is one who speaks for the people to God. 1) Is there a negative side to the presentation that we all have individual angels protecting us? 2) Doesn’t it make us feel little bit better to know that God has extended His protection to us by assigning an individual Angel whose sole duty is our safeguard? 3) And are there any direct dangers associated with entertaining this doctrine? 1) Yes – Being pre-occupied with Angels, affects the preeminence of Christ, and leaves to other dangers. 2) No, it shouldn’t – our trust and faith should always be primarily, as well as only focused on Jesus Christ as our intercessor between man and God. 3) Yes – becoming preoccupied with anything other than Christ, leads us away from the cross and Him. Anything that takes our attention from Jesus; who is our Saviour (Luke 2:11), who is our mediator (1 Timothy 2:5), who is our High Priest (Hebrews 4), and our protector (Psa. 91); is dangerous and wrong. It is un-Biblical and an error to teach that each one of us has a Guardian Angel, rather than the sound Biblical teaching that Jesus is our Guardian – ALONE. It is He that we are to keep our eyes focused on (see Luke 2:25-30 ~ Do you understand? ~ Now, continue according to Hebrews 12:2).